The naturalists of the Renaissance were obsessed with the idea to collect and describe all the secrets of earth, polymaths by passion, however only some men achieved so much confidence in this task as Conrad Gesner (1516-1565) as he avidly collected and immortalized such things as words, animals, plants and rocks. Other tried to classify catastrophes and explain the origin of earthquakes. 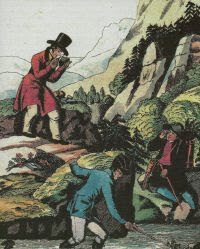 But not only nature, also time should be distinguishably and labelled adequately - in a letter to his fellow colleague the Italian geologist Giovanni Arduino (1714-1795) proposed a classification of rocks according to their supposed order of temporal deposition, scheme in part used still today. Men was and is a wanderer as he is a collector of strange things - some people will do everything to achieve a collection rich in rare books and precious specimen, there are even (presumed) bad and fool(ed) geologists. It is wonderful when collections can be completed with rare specimens - the discovery of the only known colour photographs of the great earthquake of San Francisco in 1906 is an extraordinary event. 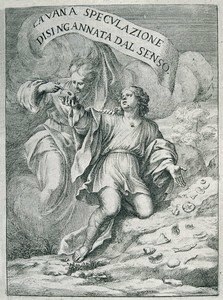 Image from "La vana speculazione disingannata dal senso" by Arduino Scilla, 1670.